The idea behind this painting had been floating around in my mind for more than two years before I was finally ready to begin in November 2015. I knew the subject matter would require a large painting surface and I must admit I was a bit intimidated by the idea of painting a life-size painting in the level of detail I imagined. I am glad I allowed the idea to percolate and develop, because I am so happy with how this painting turned out. I wanted a painting that was as big as possible while also maintaining the intimate feel of the delicate vine. By my nature, I am drawn to intricate patterns and details, the more delicate and nuanced, the more my mind wants to engage. So I wanted this painting to be an exploration of layering the textures and patterns created by the setup. Included in this painting is a Turkman rug that has beautiful deep reds, blacks, and blues, where some of the reds almost shift into purple tones. I was drawn to include it as my background because it complements the yellows and oranges of the bittersweet. The split-oak basket was an object I have wanted to paint for along time, I had just never found a place for it in a composition. So overall this painting came together and I began painting it. For the first two months that I worked on this painting, I had several fits and starts where I would have to scrape down everything I had worked on because it was just off. I do not have any photos of this era because I was so wrapped up with the painting process that I would forget to take photos. Around Christmas I took some time off from the studio. During this break, I thought about how I wanted to move forward and what I might have to change in order to accomplish my painting goals. This is where the painting was when the new year rolled around, and I was now energized to tackle this painting. The big change I incorporated into my studio habit to help me overcome the painting obstacles I previously encountered was to move my easel away from my viewpoint spot. Each time I actually painted, I needed to step 3-4 steps forward to paint, and then I would step back and compare the painting to actuality. This is similar to the sight-size painting method, but not really. I have really fallen in love with this method and have been using it on other paintings I am working on now. Once things began to come together it was just a matter of working on the details and moving forward. The painting then came together rapidly. Here is a detail of the finished painting. Last summer this painting was inspired by many ideas I had about marriage that were floating around in my head. I had just acquired a vintage double wedding ring quilt at an estate sale and fell in love with its faded pastel colors and pattern. When I decided to develop a composition with this quilt, I was motivated to find objects that would support thoughts of love and marriage. 1. My wedding band 2. The image of a sparrow on the Pennsylvania redware pitcher. Often a sparrow has been a symbol of industriousness, commitment, and hard work. 3. The image of a phoenix on the imari bowl. A phoenix is associated with the cycle of life, living, burning itself out only to rise from the ashes with renewed youth and vigor. Other items were included as well, flowers from my early-summer garden, draped fabric, food and drink. I gathered these items, and began to assemble a complex composition with a lot of individual pieces, where a linear rhythm would predominate over my tendency to rely on color-masses to create unity. I am VERY wedded to my process of painting from life in natural light when I am working on a still-life painting. Sometimes this dedication to only painting from life can affect the development of a painting. This painting, “Late Summer Tomatoes” started out with sunflowers as the leading star, however a family emergency required me to stop work on the painting after the initial first week of work. This situation took me away from home for two weeks and in that time my sunflowers had bloomed out in my garden, leaving me in search of something else to incorporate into the setup from what my garden was producing when I returned to the studio. Luckily for me, my tomatoes were especially productive and I decided to paint them again. Here are some photos showing my painting process. This image is taken from my first day of blocking in the composition. As you can see, originally a basket full of sunflowers was going to be sitting on the green step stool. At the beginning of the second day of blocking in I realized that I needed to shift the stool down some in the painting, so began to work over the previous day's burnt umber block-in with lead white mixtures. When I got back home and into the studio, things were so crazy I did not photograph any of the earlier days. But, you can see that I made a lot of progress on the quilt and stool along with the first block-in of the tomatoes. To make the change easier after what I had painted in before the two week break, I laid down a middle gray value to simplify everything, it was easier to move forward without any of the previous composition still lingering. Further along with a big push focusing on the tomatoes. The tomatoes began to ripen quickly in my studio, so I had to give them my whole attention for several days in a row. Getting closer to the finish line.... The completed painting! Late Summer Tomatoes, 36 x 30 inches, oil on linen. A closeup of the tomatoes and stems. This is a painting where the idea of its basic composition was established in late 2014. I had worked on a vertical configuration of this compositional idea in November 2014, but in December 2014 I came down with pneumonia and let the original painting get put aside. Also the orchid that had been a part of the original composition had lost all its flowers. Then as the New Year (2015) came into being, all of my various amaryllis bulbs began to bloom. And with the blooming of my “apple blossom” amaryllis, I decided to revisit the composition. In assessing the original painting, I decided to change to orientation from vertical to horizontal. After the initial block-in of the painting, I decided to focus on painting the amaryllis bloom. The other areas of the painting would last, while the flowers needed my immediate attention. As I have shared before, I prefer painting from life, even if this puts me under a bit more pressure in the race of completing the floral sections before they wilt and die. So on the first full day I had in the studio I dove in. In fact, I worked on the amaryllis bloom for the time that Naomi was in preschool, typically I get 2-3 hours in the studio during this time and I had to stop mid-day to pick her up and deliver her to the babysitter so I could have the rest of the afternoon to paint. When I returned, I was able to look at my progress and setup with clear eyes. In analyzing what I had accomplished that morning and how it affected the composition, it came to me, that the painting would display the amaryllis bloom best if I turned the flower 180-degrees. So I scraped down what I had laid-in that morning and began again. One of the truths of being an artist I hold is it never hurts to scrape down and begin again. Invariably the next go-round will be better and come more easily than the previous try, and I will feel better about the final outcome of the painting. After revising the orientation of the flowers, I worked on areas of the painting choosing to jump around depending on the amount of uninterrupted studio time I had to dedicate. 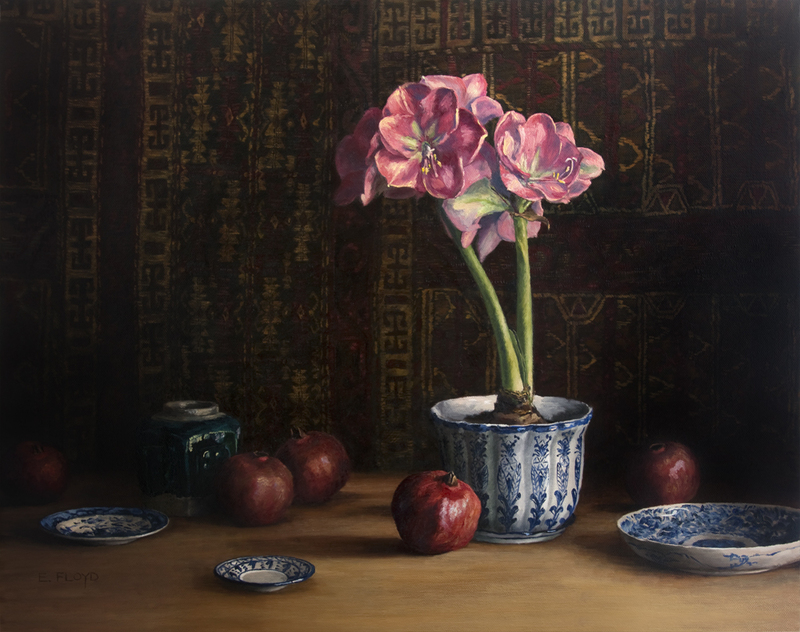 In the first phase of completing this painting, I focused on the amaryllis bloom. As soon as I got to a certain point, I was ready to tackle the quilt in its entirety. I knew this would take A LOT of time and effort, however I LOVE painting drapery and fiddling with the minutia of shifts in value found in painting cloth. My decision to tackle the quilt in a somewhat organized manner, working in adjacent areas most of the time was helpful in making sure that the overall continuity of the colors and values would read as a whole, even thought it took almost 9 long painting sessions to get the first layer of the quilt completed down. After working for two long days on the quilt, I needed some immediate gratification in the last hour of my painting session, so I moved down to the lay-in the antique suitcase I got from Steve's grandmother. By the end of this session, I had figured out about how long it would take to complete one of the four sides that make up each double wedding ring, and was able to estimate how much time I would need to cover the entire canvas. This type of hyper-intensive attention to detail also takes a lot of mental energy. And the best way to remain fresh over a long day of painting is to plan on only focusing on one area at a time, and when your brain starts to turn to mush and you no longer care if you are getting it right. This is the time when you take a break. Deep work is mentally fatiguing and to stay on top of your game, means listening to yourself. The type of breaks I like best to take when I want to mentally refuel my mind is to get on the yoga mat and complete a series of stretches. I think this type of break is the best for resting and recharging, for me it usually takes anywhere from 15 to 30 minutes of resting my eyes and stretching to be ready to start again. At the end of this painting session, the canvas was finally covered and I could begin to plan how to further refine the painting and make it read a bit better. For this painting I used a lead white with a walnut oil binder, so it was taking a while for my white layers to completely dry, which, was fine with me because I needed some time to map out the next and hopefully final stage. This year it is my goal to work on a few large and more complex compositions and I thought you may enjoy reading about my process. So today I want to share with you a still-life I began in early January 2015, this post discusses the first phase – focusing on painting the amaryllis flower from life. This past December when I was finishing up my double wedding-ring quilt, I began thinking about how fun it would be to paint this quilt in a still-life painting. Then I began pondering what to pair it with… knowing that it would have to be something strong to counteract the bright colors and complexity of the quilt. As I was thinking about possible compositions, one of my large “red dragon” amaryllis bulbs came into bloom, and all was settled. I knew I could begin the painting I was pondering right away. As an artist, I prefer to paint from life and in natural light. This being said, in the winter months I must rely on winter blooming flowers, which typically involves forcing a variety of bulbs inside. My favorite winter blooming bulb is the amaryllis, a tropical bulb that prospers in our warm interiors. When painting flowers, painting from life is my preference because I feel my work captures the gesture and essence of the flowers I am working on. I try to stay away from relying too much on photo references, I think it is because photographs are one more filter away from my own personal relationship I have with the flowers. Being an avid gardener and that I typically am nurturing and growing the specific flowers I am painting, it is like I have a deeply felt relationship with them, and I want the flowers to be there while I am painting and trying to convey what I am feeling in paint. Because of this desire to paint from life and knowing a flower only has so long before it begins to fade, I have to plan the sequencing of how to paint every given floral still-life composition. Typically I begin every painting with a drawing painted in with burnt umber, then I begin to immediately paint the areas with the most limited lifetime, in this painting it was the amaryllis flower. By beginning with a burnt umber drawing, I make sure that I can get the scene onto the canvas as I want, establishing an accuracy in proportion and scale. I always try to get the drawing as correct as possible, even knowing that once I begin to paint the under-drawing is going to be obliterated. I view this phase as a very important step because I feel like it helps me engage a level of muscle memory and mental connectedness I want to have with my compositions. After the under-drawing is finished, I will take a small break (15-30 minutes) to get away from the painting, so when I return I will have fresh eyes and will be able to identify any errors in the original burnt umber drawing. If all is well, I dive into painting the most important and ephemeral subjects. I began painting the amaryllis flower right away. Blocking in color masses, keeping the shapes large and descriptive of the total structure of each flower. When I paint flowers I am also trying to gage how long each flower will keep fresh and bright. I knew from watching how the flower opened that the flowers on my right were the ones that would fade the quickest. So they were the first ones tackled. Leaving the two flowers on the left to be partially laid in. Because when painting you make decisions based on the adjacent areas, I also began laying in the values for the neighboring background areas. Upon returning to this painting the next morning I realized I needed to spend some more time laying in the adjacent background areas. So I began to tackle more of the double wedding-ring pattern and the white areas. After the adjacent areas were laid in, I went back into the amaryllis flower and began refining. I also took out the back of one of the flowers that had wilted overnight. Sometimes I will keep a wilted flower in my painting even after it has ceased to exist, however with this painting I realized the void left by that one flower, now wilted, made for a more dynamic shape of the overall flowerhead. On the morning of third painting session, I realized that this would be my last day to work with the amaryllis flower before it totally wilted. So I worked almost exclusively on it. As the end of the day drew near, I had just about finished with painting the amaryllis, so I began to focus on painting the quilt. I still stayed close to the areas of the amaryllis because I knew that I would need to use this area to key to as I worked on the quilt when the flower would not be there to help me judge for correct color and value. For me, painting is the experience of slowing down and absorbing what I see, and by painting objects that have a fleeting life, such as a flower, I feel like I am making their beauty more permanent, something to be admired for a long time to come. Thank you for stopping by and I will be back with another post that describes the next phase of this painting. Sometimes I am asked if I ever complete commissions, and my answer is “yes, I do!” and then I go on to explain how I approach commissions, as my process is not typical… this is because when I work on a commission, I paint three different compositions of the subject matter, and my client gets to select their favorite of the three. The reason for my process is because I really enjoy exploring a single subject matter from various points of view. In my mind, creating artwork is more than just recording something visually accurate, it is about capturing the essence and meaning of the subject. And I am an artist who loves to share my sense of beauty and often this is something that cannot be pinpointed but instead is felt and made aware of by experiencing. And by investigating a single topic (or object) in multiple ways, I begin to really understand it and thus am better able to express what makes it so special and beautiful. 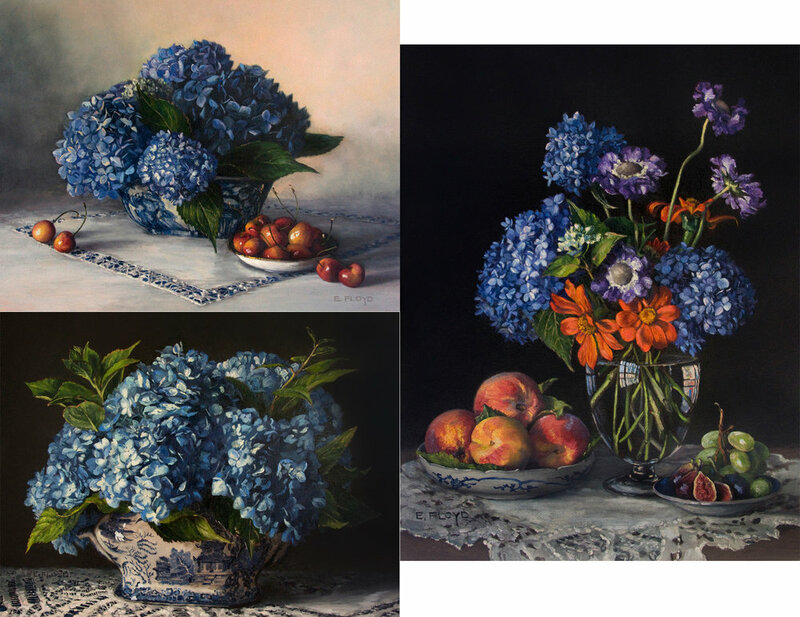 This summer I was asked to create a still-life painting of blue hydrangeas, and now I want to share my process and how I created the three different compositions. The first thing I did after accepting this project was to brainstorm about ideas, thinking about color schemes and potential schematic diagrams of the big geometric shapes and breakdown of compositional space. If you know me in person, you know I am always toting around my “idea book”, a spiral sketchbook where I write down EVERYTHING. Being a colorist, before I ever began to investigate the compositional formats, I thought about how I wanted to emphasize the blue of the hydrangeas. Often I will amplify the visual impact of a color by paring it with its complementary color and color temperature. So being that I was going to be painting blue hydrangeas, in my mind’s eye I wanted to surround the flowers with warm oranges, peaches and reds. From my compositional thumbnails and sketches, I became interested in pursuing two trains of thought, one was where the hydrangeas were centered and the central focus of the composition, and the second was where the hydrangeas were part of an entire scene, visually interacting with the other objects in the painting. With this first composition I explored utilizing color as a way to emphasize the blues in the hydrangea flowerheads. These hydrangeas were from my garden, so I also got to incorporate the flowerheads at different levels of maturity, the older blooms had larger individual flowers in a lighter dusty blue where the flowerheads that were just beyond being a bud were variegated in color from a pale green shifting into cream in some flowers and in other flowers with deep blue tips. For the second composition, I wanted to explore a vertical format while incorporating a variety of flowers into the bouquet. This painting is also an ode to the French artist Henri Fantin Latour, because I think he is the master of all floral still lifes and is an artist I really look up to. I wanted to create a sense of mystery while also emphasizing the blue of the hydrangea blooms by including notes of orange, yellows, and roses throughout the composition. During all this time when I was working on these commission paintings, I was constantly looking at other artist’s interpretations of hydrangeas and it was through the process of painting hydrangeas and viewing other paintings with hydrangeas in them that my own opinion about what makes hydrangeas so captivating as a flower crystallized in my mind. To me it is the lace-like quality that comes from the individual flowers of the flowerheads catching light, and of the other individual flowers falling into shadow. The overall round form of the flower heads are punctuated with the delicate edges and details of the individual flowers. So when I began the third painting, I really strove to focus on the effects of light and shadow, allowing my earlier explorations of color complementaries to take a backseat and to expressly investigate the way the light fell across a bouquet of hydrangeas. Texture and the lace-like qualities were my focus, so I zoomed in and made it a painting about the flowers. All of these paintings were fun to paint and I learned so much from this process. The client selected the third painting. 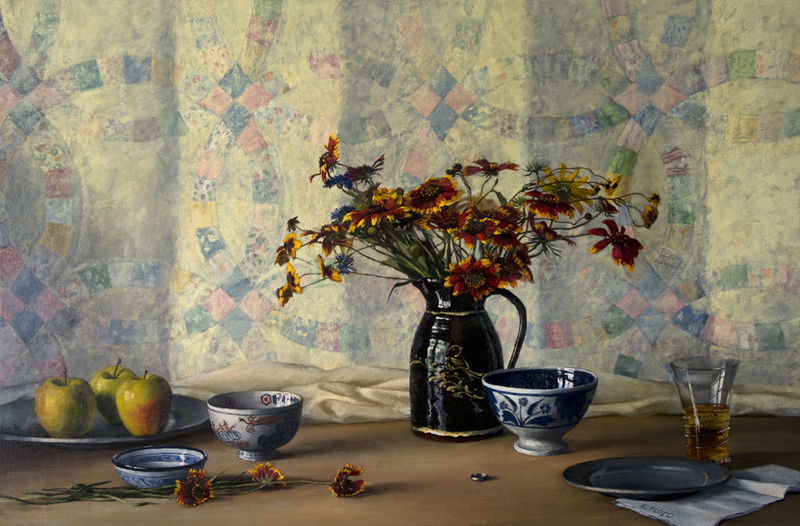 Interested in commissioning a still-life painting with a special flower or family heirloom? Please visit the Commission a Painting page to learn more. Are you excited about the way this year has begun? I am… because so much happened last year that was never planned for or expected, and brought about such amazing results, that I am entering 2014 with an overwhelming sense of optimism. Now that we are in the new year, I am eager to share new work and chat about art. Thanks for stopping by and sharing the experience.